Stop in and see us for some Poppy's Xtreme Donuts from our Donut Shop in Marion, IN, or our store-front location in Peru, In. Come try our wide selection of donut flavors at Poppy’s Xtreme Donuts. From glazed to cream-filled, we make all of our donuts with the finest ingredients. Your satisfaction is our number-one priority. Feel free to contact us with any questions, comments, or concerns you have about our Xtreme Donuts. 5:00 a.m. until sold out. 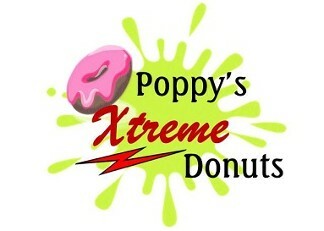 Come enjoy the xtreme flavors we have to offer at Poppy’s Xtreme Donuts. Located in Marion, and now in Peru Indiana also, we are a donut shop offering a wide variety of Xtreme Donuts. Why Xtreme? Xtremely tastey, Xtreme size in some cases, and serving you with Xtreme customer service. As a family-owned-and-operated business, we strive to make the best donuts possible by using quality ingredients only. You also have the option of picking up your order or using our drive-thru in Marion. Since our donuts are delicious, affordably priced, and convenient, we know you’ll fall in love at first bite. We are so very pleased to be partnering with several local businesses that are currently featuring our donuts. Supporting each other, along with customer support is how a small business thrives. Please visit those businesses, visit their Facebook pages, and show your support of their business as well. We are delivering to: Chappy's Drive-thru Convenience Store (Gas City), Marion General Hospital (www.MGH.net) and King Gyros (weekends only). We are also supply donuts to Circle K locations in Marion, Jonesboro, Converse, Van Buren, Summitville, LaFontaine, 2 locations in Kokomo and 2 in Portland. We continue to supply Marion Pantry (Miller/9th St), Sunoco Mini Mart on Miller Ave and 18, Marion Mart (Friendly Market) 2246 W 2nd,and Marion Food Mart on Baldwin Ave, all located here in Marion. We also service Hydration Station in Greentown In, Gallahan Truck Plaza in Peru, and Mexico Marathon in Mexico In as well. We have added 7 McClures locations: in Logansport, Kokomo, and in Peru, Fast Mart Citgo in Manchester, Uptown Marathon in South Whitely, and Marathon Mini Mart in Silver Lake. We also service Food and Fuel in Hartford City, and Fast Lane Foods in Galveston. We appreciate you supporting these businesses. Contact our donut shop to savor an array of delicious gourmet donuts.